I love how our collection of coloring pages by Melanie Hope Greenberg is growing! We now have several summer-y printable pages for your kids with the addition of this seaside scene. 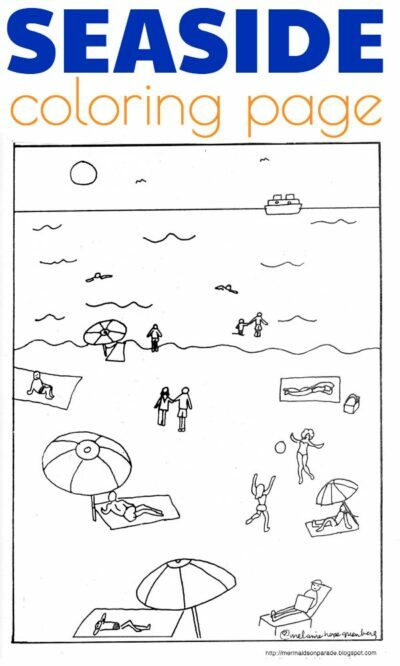 This beach coloring page seems kind of retro to me, what about you? One of my favorite thing about Melanie’s coloring sheets is that the scenes include small details, which make them nice for older kids. Melanie agrees with me that kids primarily need free time to explore art projects in their own way, but that printables are great for those moments when you really need a quick boredom buster. Also, lots of her pages can be transformed into pretend play activities and I think this seaside scene would make a great backdrop on a mini stage for her mermaid paper dolls or fish puppets. Follow Erica • What Do We Do All Day?’s board Coloring Pages & Printables on Pinterest. Fun coloring page! We went to the beach the other day and it looked just like this.